Erin has been wonderfully generous with her knowledge, helping me learn about working with leather and improve my performance entries. So I was excited to find an opportunity to me to use my skills to help her out in kind. 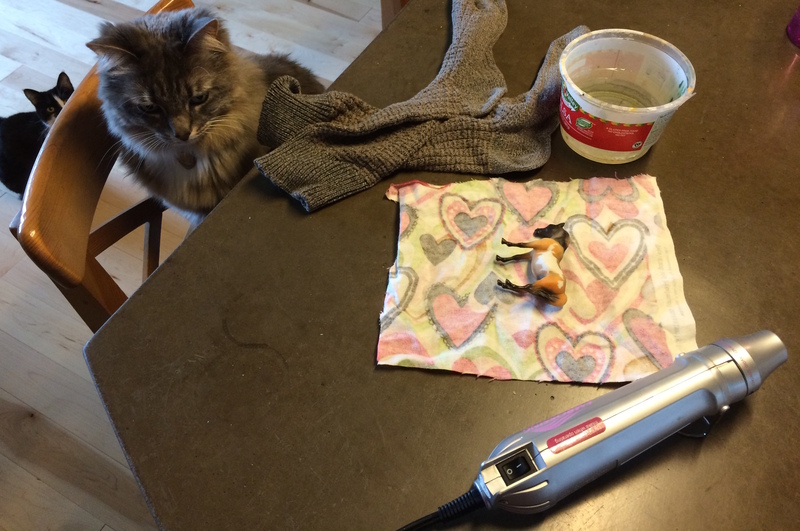 Although Erin’s short foray into oil painting was pretty successful, she doesn’t do any customizing or repairs herself. Being a clumsy person, I’ve inevitably learned to repair models. 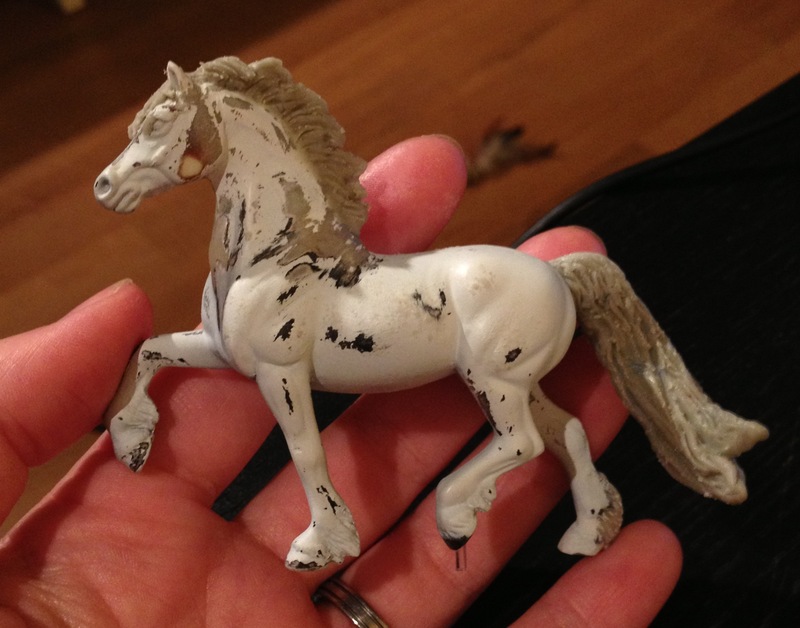 Earlier this month I was visiting Erin and found several horses to kidnap and repair. I figured I could do some mini tutorials as I went. 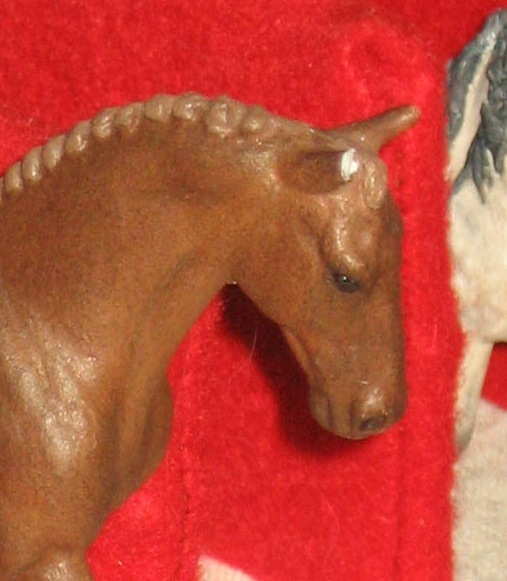 The first horse in need is a OF Stablemate Arabian Mare who was formerly a part of Erin’s mini show string. 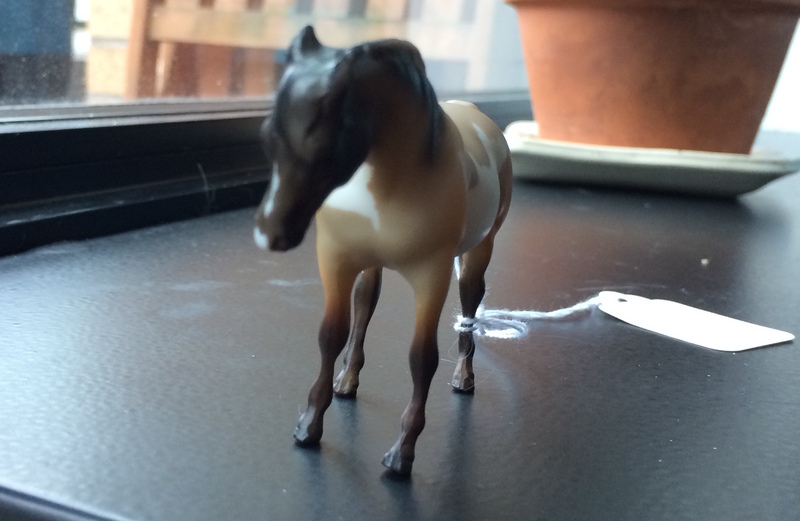 Alas, Miss Pinto has been staying home since she developed a bent foreleg. Ouch! That can’t be comfortable. 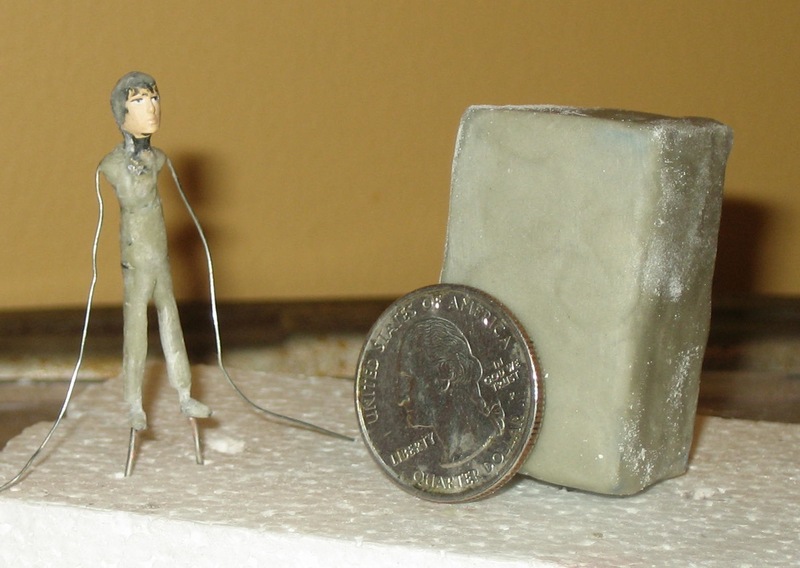 Bent legs are a relatively common problem in plastic models and can be caused by heat, pressure or a combination of the two. 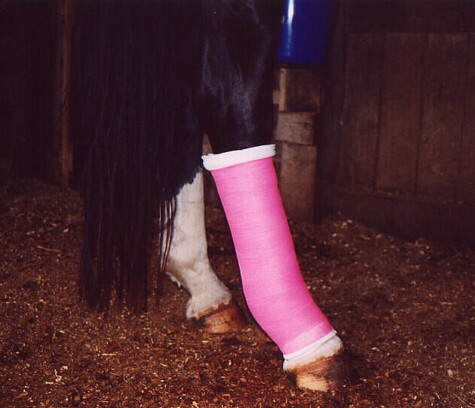 You can prevent bent legs by protecting your horses from extreme temperatures (e.g. never leaving them in a hot car) and packing them carefully for any transport. Fixing a bent leg on a show quality model follows the same general practice as bending a leg while customizing- only you need to be much more careful about the finish. Overheating an area can cause the plastic to bubble. To make this repair, you’ll need a heat gun, a wide bowl of cool water (big enough to dunk your horse into), and something to protect your hands while you shift the leg. I use an old pair of thick socks. The plastic will be hot when you touch it, and you will burn yourself without something over your skin. Trust me. Curious cats are optional but encouraged. The key to this is to take your time. 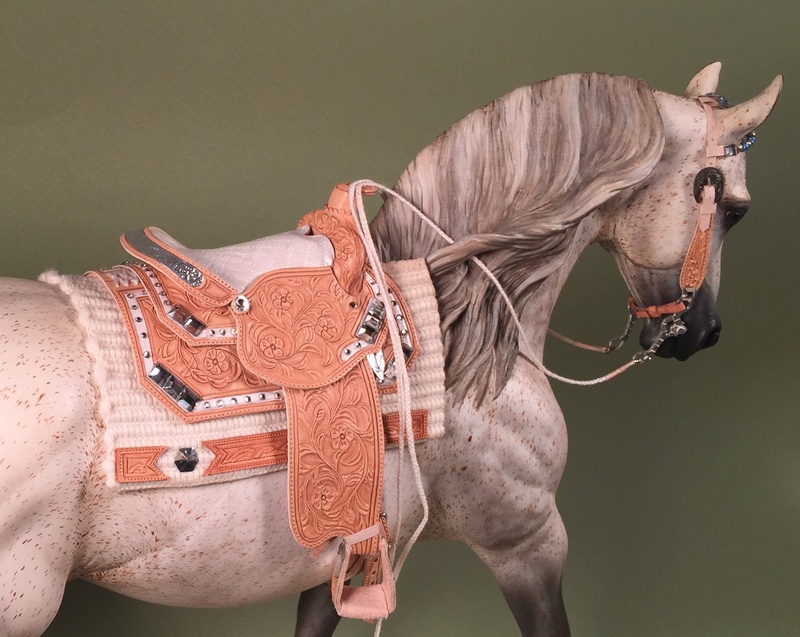 With your hand protection on, turn on the heat gun and wave it back and forth slowly over the bent leg, keeping the gun about 3/4″-1″ away from the horse to prevent damaging the finish. Move the gun so that every side of the leg gets heat. 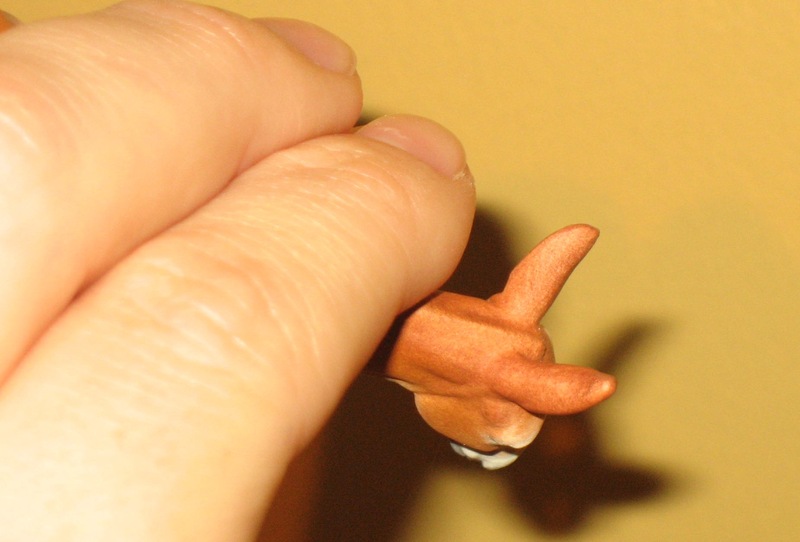 Bends are generally going to happen between joints. Pinpoint the place you need to manipulate to fix it, and aim to get that whole area warm. After a minute or so, gently try to bend the leg back into the correct place. If it doesn’t move easily, heat it a bit more and try again. Once you’ve got the leg in the position you want, dunk it into the bowl of water. That cools the leg and (hopefully) keeps it in the new position. Once the leg is moved some, check your horse again. Is further bending needed? If the leg is being stubborn, heat and move it again. Something you have to do this a couple times to get it right, as the leg naturally wants to move back into the bent position. Be firm, and show the leg who’s boss… but gently and slowly, so as not to damage the finish. The final result: showable once again! 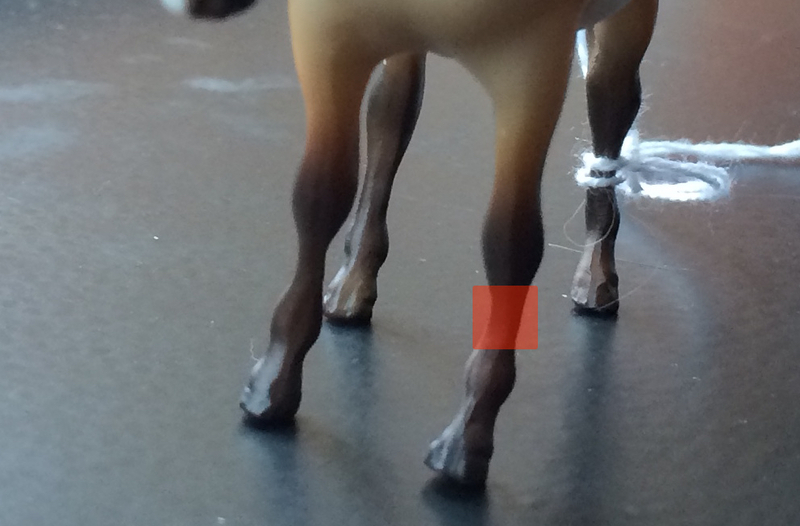 With only about ten minutes of fiddling, this mare now has a straightened leg. She’s ready to go back out on the show table! As I’ve mentioned I’m busy with a new job (wheee!) and adjusting to much less pony time. I’m still managing to sneak it in though, never you fear. Two of the top priority projects right now are fixes in preparation for the NW Congress Live Show at the end of the month. Kettil Blacksmith had a tough ride to his last show, despite my efforts, and ended up with a broken tail. He now has a double-wired, super reinforced tail. Since that picture was taken I’ve added acrylic to cover the epoxy patch. He looks pretty good, but still needs some pastel layers to make everything match. Hopefully (knock wood) this will be the last time that tail needs repair. The other guy in the Horsey Hospital is Troy Soldier, who isn’t a horse at all. This wiley mule came to the Harvest Halter Live with some ear tip rubs that I hadn’t noticed. I did a quick n dirty fix with a brown marker (thanks Vicky!) and he managed a red ribbon in his breed class, but he needed a real fix. Luckily, I’ve been keeping notes on the colors I use on recent horses, so I knew what would work with a minimum of fussing. I have a busy work week before Rose City Live on the 8th, so I wanted to get ahead on packing. I am sure glad I started early, because I found not one but 4 horses that needed repairs! Argh. 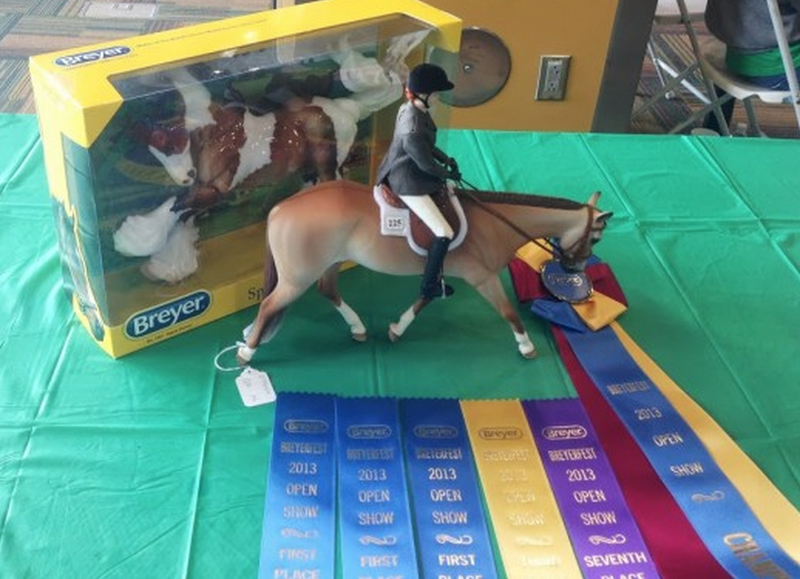 I was really peeved at first (especially because it was my clumsiness that added one of those horses to the list) but then I realized that in the big scheme of things, this is not really worthy of exasperation. For one, I had caught everything in time to fix it (not, for example, the night before) and nothing needed major work. But secondly and more satisfying, I realized I am perfectly capable of fixing all of the problems. 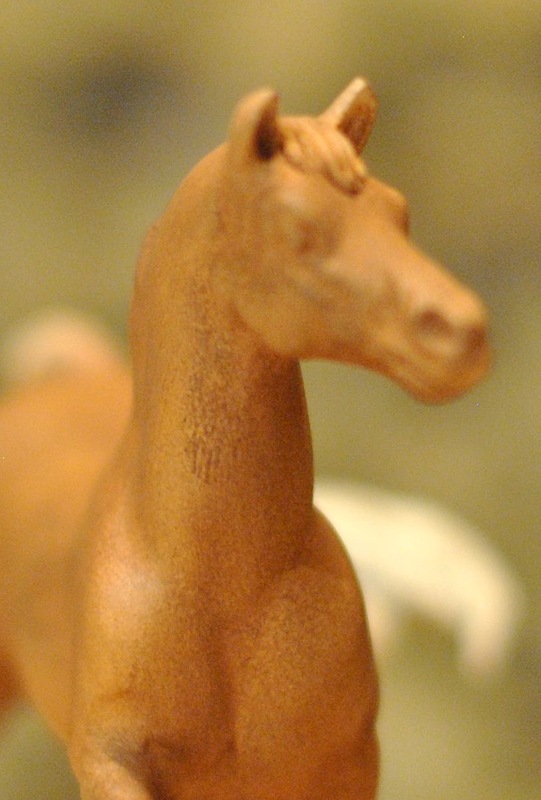 I made the horse in the first place, so I can be confident in putting it back on the work bench for repairs. I’m happy that I don’t need to send these guys off to someone else to get repaired- I just added it to my pre-show to do list. The four models went into the “hospital” on Tuesday, and by today nearly everyone is ready to go. Their fellows are all packed, and the other projects are nearing completion. Hurrah! 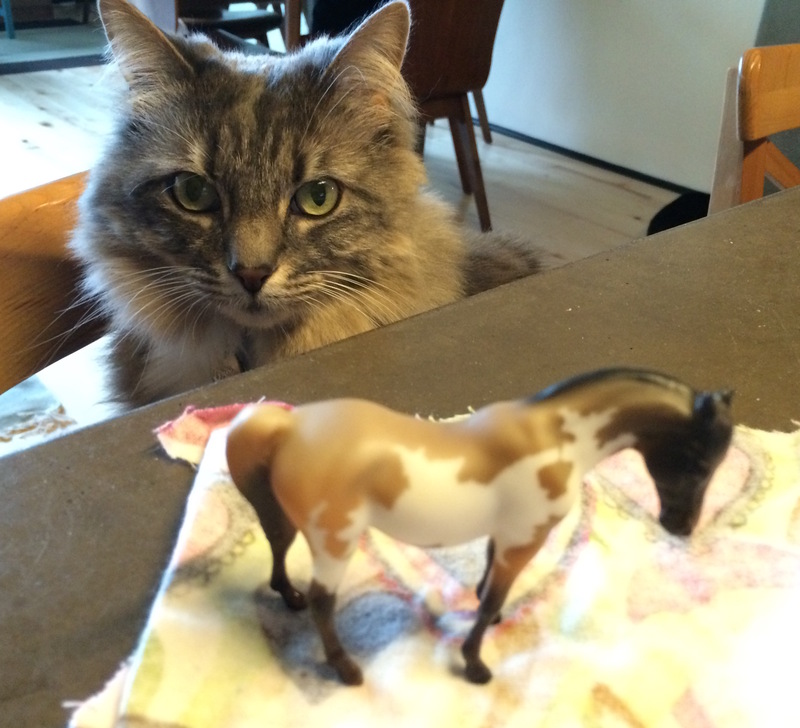 I have tried to paint horses entirely in acrylics before but it’s always ended badly. I find it extremely difficult to blend acrylics properly, let alone get them to go down smooth. The reason I fell in love with pastel finish work is because both shading and smoothness are pretty inherent in the medium. It’s great. But pastels are not very good for fixing chips or mistakes in finish work. With my recent rash of restoration cases, I’ve been forced to use acrylics- and, to my delight, to get better at using them. 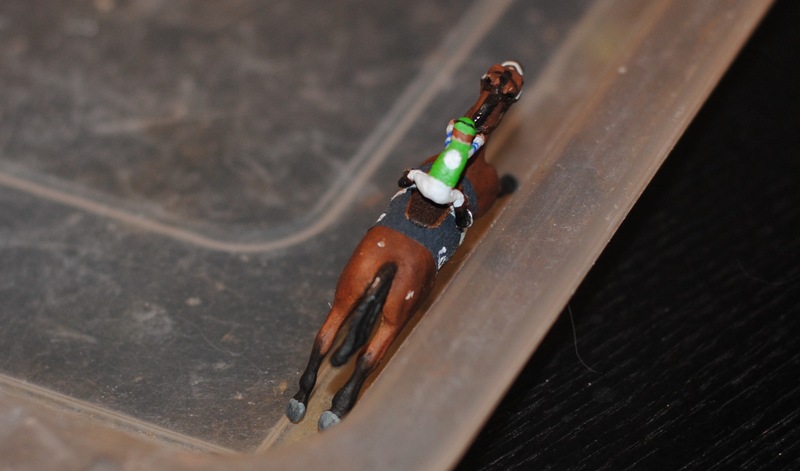 Four strategies helped me in my endeavor to fix the finish problem or chips on Alpo, Doublet, and Troy Soldier. First: Have plenty of applicable colors on hand. 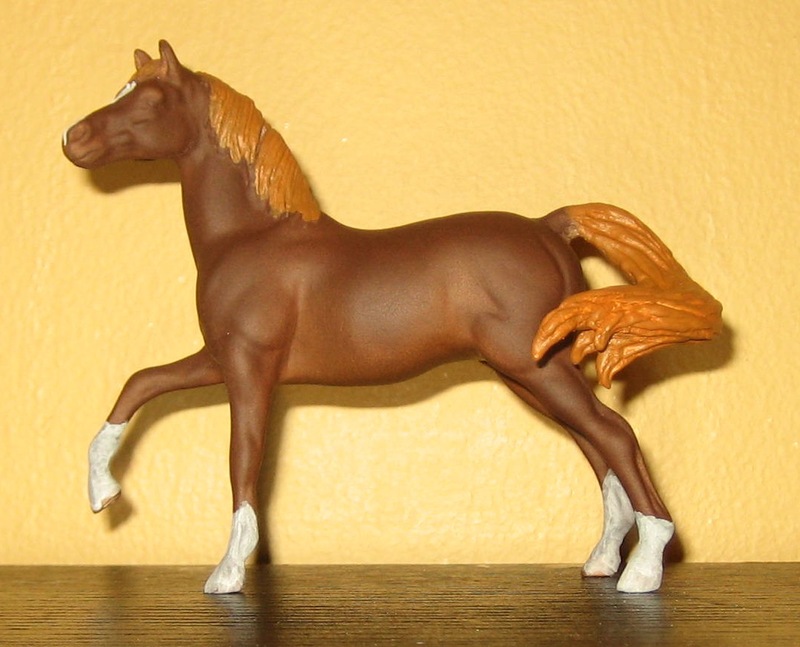 Any base color that might be a part of your horse’s lovely coat can be relevant. While doing these repairs I was constantly surprised by what colors worked and what didn’t. I was very happy to have all these different colors on hand in these great Ceramcoat bottles. I lucked into these at a garage sale for a pittance, but now that I know their awesomeness I’d be happy to pay full price for them. Besides, these little bottles hold a lot of paint and keep it neat and fresh much better than paint tubes, so they’re a good investment. 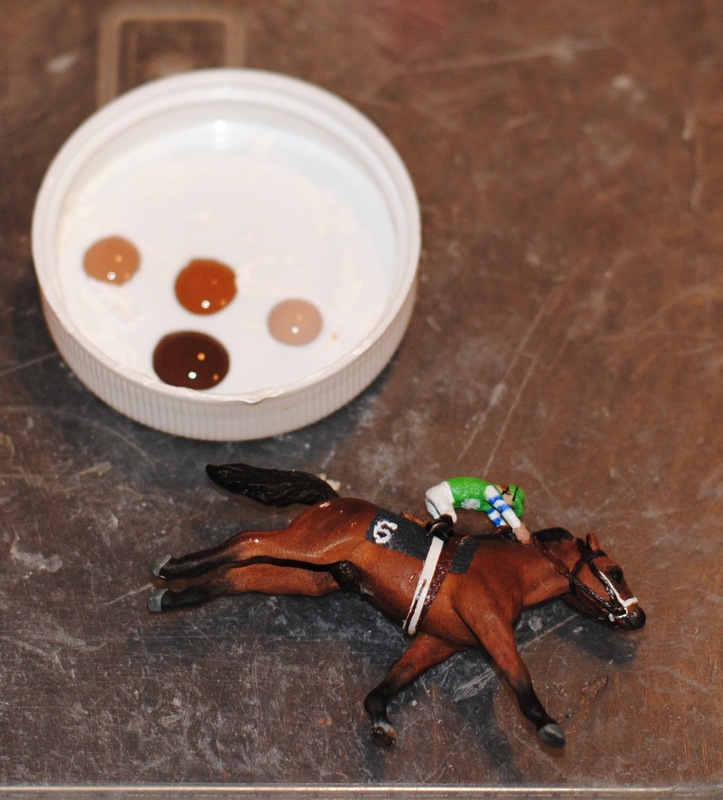 Having so many easy to use, pre-made horsey colors made color matching much easier- and less wasteful too. Third: Work quickly in small batches, with water and a rag close at hand. 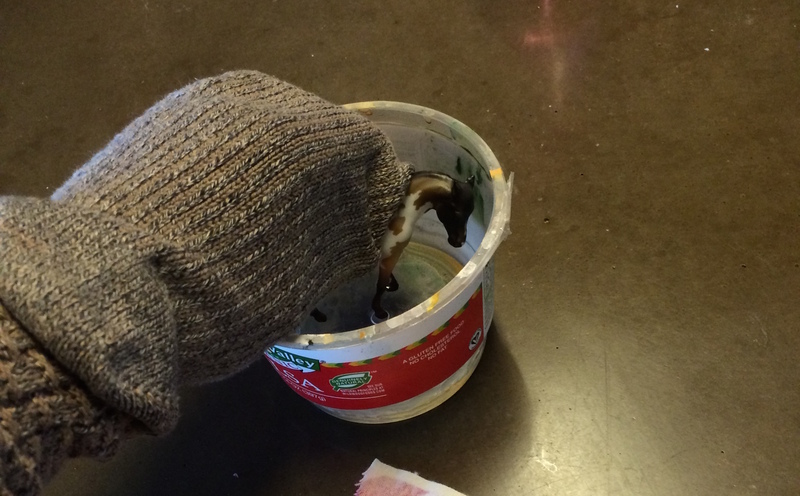 Acrylics dry very fast, so it’s important to remove applied paint immediately if it doesn’t match. Happily, wet acrylic is easily removable if you act fast. I brush the offending area with water to liquidate the applied color. Then I soak up the water and pigment with a larger, dry brush, which I wipe clean and dry again on the rag. Depending on how much pigment you are removing, this may take a few repetitions. 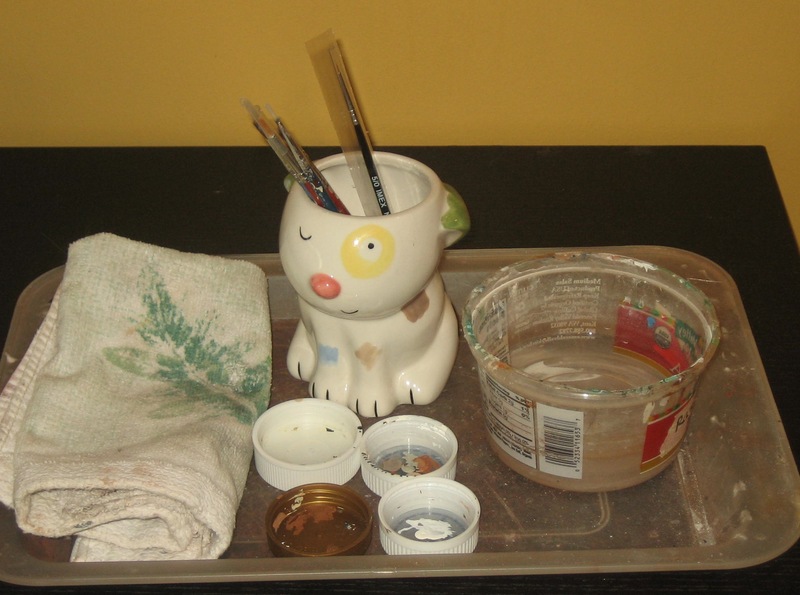 Be careful not to let it leave a line of color around the edges of the area- you may need to scrub the remaining pigment a bit with the wet brush to pick it up. 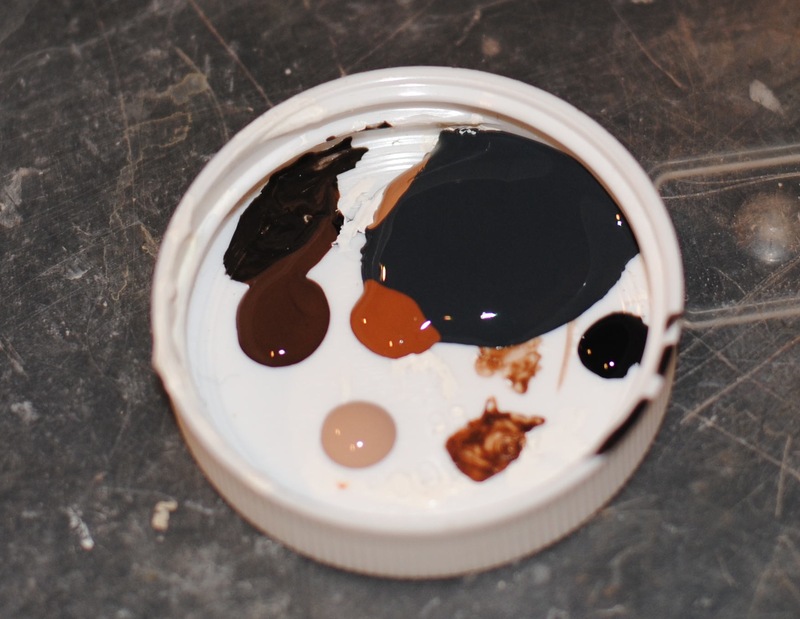 Fourth: Blend beyond the repair. The goal of finish restoration is of course to repair the part that’s damaged. But if you only put your acrylic patch there, even the best color matching is going to leave a funny shape. You want to concentrate your pigment on the problem area, but use that same color watered down to blend into the rest of the horse. 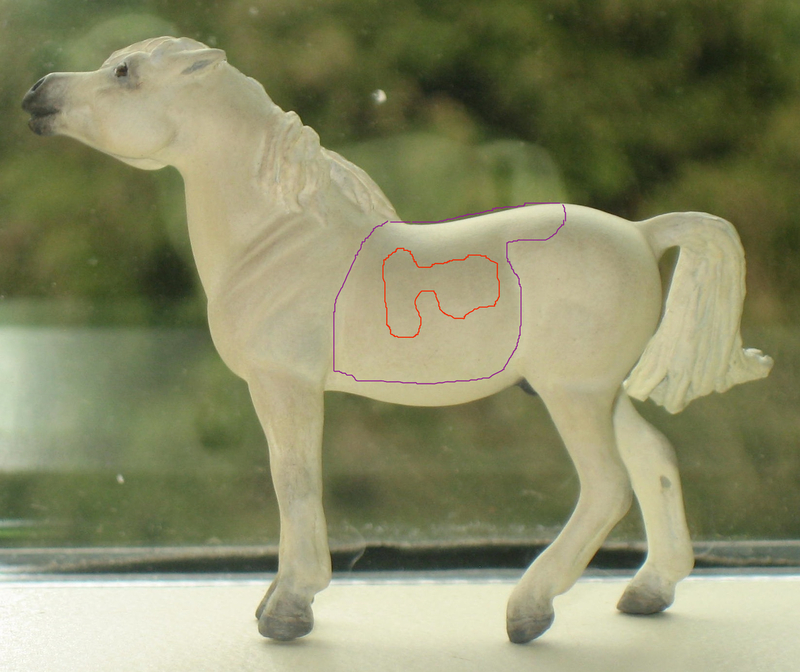 Alpo had a weird “rain rot” mark in his pastel work, outlined in red below. That’s where most of my pigment went, but I brushed thinner and thinner acrylic over the rest of the purple-outlined area as well to blend the repair into his body. Speaking of acrylics, here’s Lilah with some of her acrylic detailing mapped in. 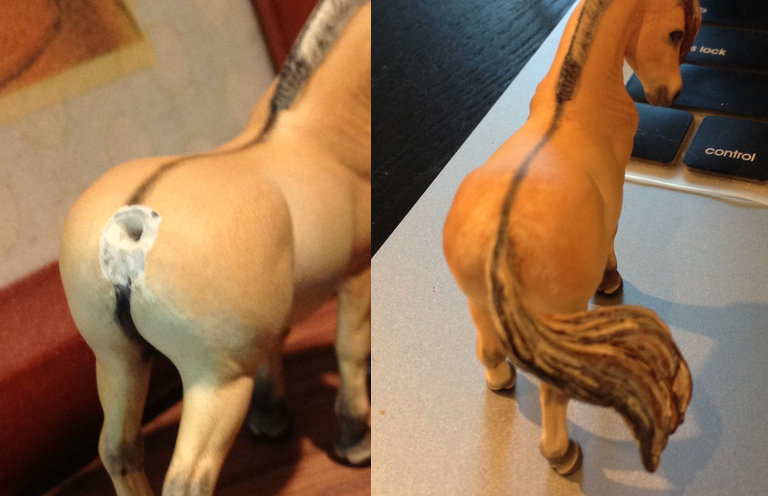 The orange in her mane and tail is a bit garish, but even with that toned down I think she’ll be quite a stunner. If all goes well, I’ll be headed to a live show at the end of March. 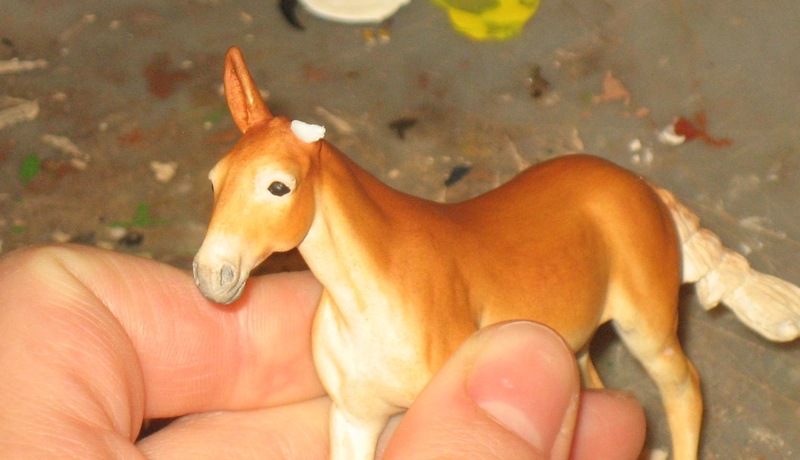 I’d like to have some of my in progress horses done by then, but various problems are setting me back. Arg. 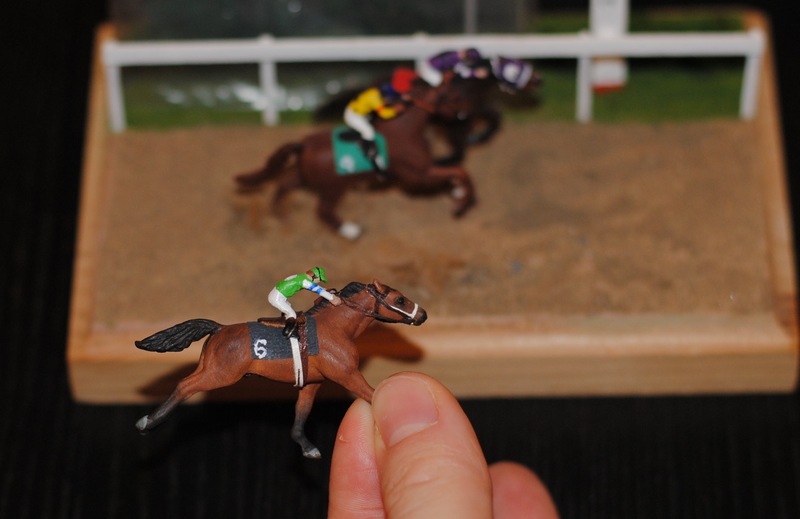 Unfortunately, one of the wounded from last week’s Great Feline Attack was Rumble Strip, the star of my recently finished racehorse diorama. 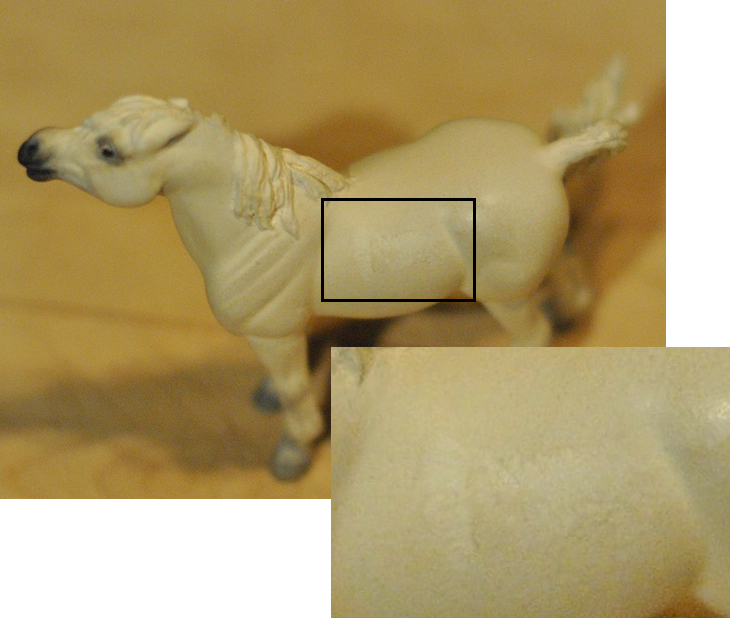 Not only did he break off from his acrylic rod and the diorama base, but he also suffered some damage to his finish. I am not confident using acrylics to paint a whole model or really achieve any shading, but at least I can do some discrete color matching to fix these boo-boos. First I identified which brown shades would go into his repair. Then I set about mixing and matching colors to find which matched his damaged spots. 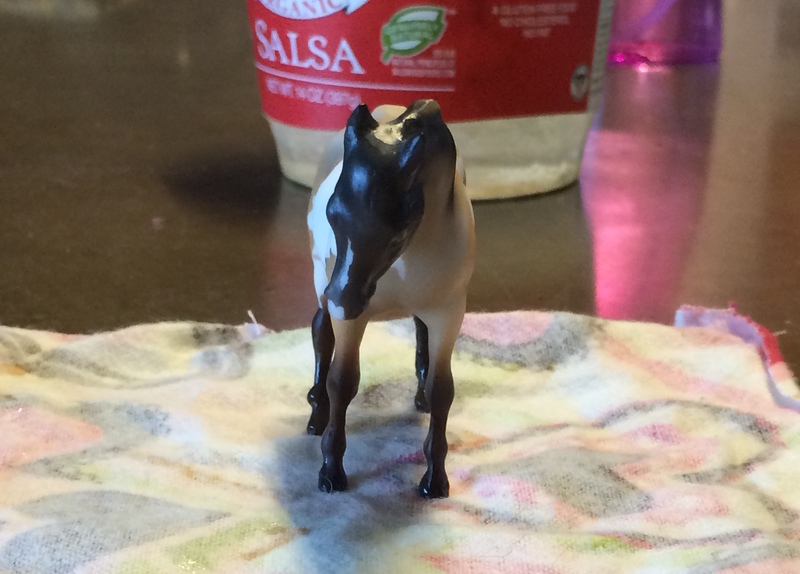 The nice thing about acrylics is that you can remove them from the horse with water and a cloth or paper towel if the color doesn’t work- as long as you do it right away. So I could mix a color and test it on a spot without doing further damage to the original finish work. Happily, it didn’t take too long to fix up the damage. He certainly isn’t LSQ, but he wasn’t before either- and now he’s back to his lovely presentable self. Attaching him back onto the base was relatively easy. All I needed was super glue with a fine tip and a bit of patience. It’s not as neat as before, but I might be able to file down some of the excess glue- once I’m positive that it’s thoroughly dry. And now the race horses are back on the shelf where they belong. Alas, the other repairs will not be quite as simple.